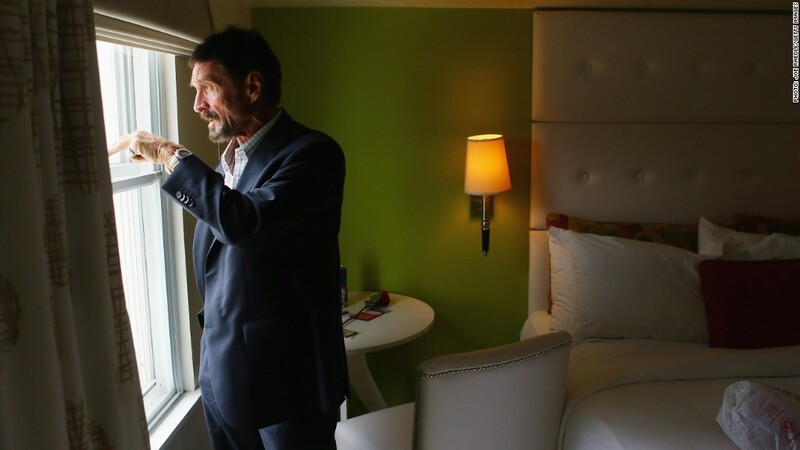 This is John McAfee, shown earlier this month at his hotel in Miami -- not to be confused with McAfee, the security company he left almost two decades ago. There's been a recurring topic of conversation in McAfee's executive meetings over the past month: John McAfee, the company's founder. John McAfee sold his security business in 1994 and has had nothing to do with the company since. But his name has dominated headlines since Nov. 11, when police in Belize said McAfee was wanted for questioning in a murder investigation. "We've certainly been discussing it, that's for sure," said Michael DeCesare, co-president of McAfee, which is now a subsidiary of Intel (INTC). "He's gotten a lot of coverage, and we've been following all of it." The headlines about John McAfee have only grown stranger over the past month. The Belize resident fled his home, giving a series of press interviews from secret hideouts in which he professed his innocence and offered conspiracy theories about the Belize government. He went to Guatemala, where he requested asylum, then became mysteriously ill when he was arrested by police for entering the country illegally. (He now claims he "faked a heart attack"). He was subsequently deported to Miami last week. It made for a fascinating news story, but as far as the security company that bears his name is concerned, "McAfee" has been in the headlines for all the wrong reasons. Still, the company says it is not considering a name change. "No, no, no," said co-president Todd Gebhart. "John's had an interesting lifestyle, but our customers understand the separation that takes place. The McAfee brand is associated with a company that protects their business and employees." Co-president DeCesare said the company has discussed the headlines with its top corporate customers, who haven't expressed much concern. "They're very educated about fact he's not involved in the company anymore, and they know our brand isn't tarnished," DeCesare said. He acknowledged, however, that there is "less awareness on the consumer side" about the fact that John McAfee isn't still at the company's helm. The co-president didn't think any of this amounted to a PR catastrophe, though. "Look, we're not happy it's going on," DeCesare said. "We are happy that it seems to be coming to end."